Trade Via Trend site always looks for and elaborates companies that are backed by value and also that are in trend. Thus, the value investors, trend followers or swing traders are able to adapt their trading techniques within their preferred strategy. In the middle of March, we have reviewed CACI International Inc, because the company fulfilled all necessary requirements for a further stock price increase. By now the stock is 12% up while moving in a style of trendy dance. Is it time to sell? Not really, time to buy more shares is perhaps much better deal. Health, Intelligence Services, Intelligence Systems and Support, Investigation and Litigation Support, Logistics and Material Readiness, Space Operations and Resiliency, Surveillance and Reconnaissance. CACI International has achieved International Organization for Standardization/International Electrotechnical Commission (ISO/IEC) 20000-1:2011 certification by NSF International three days ago. This certification proves that CACI’s technology systems and processes implemented on customers’ environments adhere to the best practices as defined by the ISO/IEC standards. More about the certification here. The company announced on 18 July 2018 that it has been awarded a task order with a ceiling value of $122 million by the General Services Administration Federal Systems Integration and Management Center to develop advanced electronic communications systems in support of the Special Communications Mission Solutions (SCMS) division of the Naval Air Warfare Center Aircraft Division. Read more on Business Wire. This is certainly a great deal that will guarantee great profits in the future. Navy has awarded the company a $48.5 million single-award, indefinite delivery/indefinite quantity contract to provide integration, installation, sustainment, and engineering services to the Naval Air Systems Command Naval Air Warfare Center Aircraft Division (NAWCAD) AIRWorks Rapid Development Capabilities Integrated Product team. Read more on Business Wire. CACI International stock brings an attractive view compared to its peers in the industry. The below ratios signal the fact that stock is currently undervalued. CACI International stock has been trending up or down for 20 years since they are listed on stock exchange. In the recent history, the stock broke a 4-month-old resistance level (brown dashed line) on February before we had reviewed it on March. The price followed the trend bouncing from its support (blue dashed line) until it pulled back and the previous resistance successfully transformed into a support level (brown dashed line). Since that time the price has been going upwards. Currently, the orange dashed line tries to form itself into a support level, although it may need more development. The real support levels are depicted by moving averages at the moment. 50 SMA serves as the present support level. The price has recently bounced from the support and managed to sit on the 20 EMA. Cardinal element that signals an upward trend in recent days is a lower volume increase of higher price decrease on Monday exchanged for higher volume increase for a shorter price increase on Tuesday – Depicted by green arrows. It may sound complicated – see the Volume Principles if needed. The spiky volume bars in blue circles represent a strong interest by institutional investors in this stock. The interest is in long-term. Generally, the upward price trend is supported by favorable on balance volume indicator. CMF is showing strong buying power and RSI is over 50 again. The only technical indicator that does not go with the idea is MACD. The MACD line needs to cross a signal line to support the uptrend. I strongly believe that we just need some more positive days. Compared to Nasdaq Composite the CACI International stock always does better during the pullbacks. Nasdaq is hitting its supports at the moment due to Facebook drop and general panic among FANG stocks that represent 50% of the entire index. Once this startle is over, the stock will be ready to rise again, even outperforming Nasdaq. CACI International Inc signifies a great opportunity for both long-term and short-term investors. The stock applies well for trend following strategy and value investing principles. Stay disciplined and focused on the big picture! If you like this article, please share it using below buttons or any other way you wish! 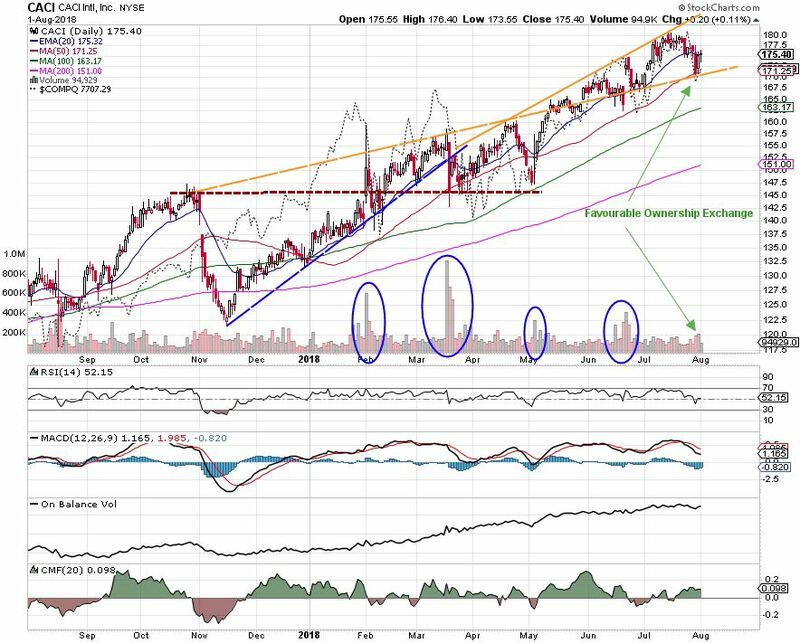 iQiyi, Inc. – Top Performer needs to consolidate?